Due to changes in the law, no one is allowed to sell or even gift any sawfish rostrum via intrastate or interstate within the U.S., due to their upgrade to "Critically Endangered". These items are shown for display only on this page. We hope, due to these strengthened laws, that these beautiful creatures will multiply over the years to come, and never go extinct. We donate support to conservation groups to continue to monitor these species and all other species in danger of extinction, to bring them back to healthy numbers. NOTE: The international trade of all sawfish bills were banned by the C.I.T.E.S. convention in June 2007 due to their being categorized as ENDANGERED, Appendix I. This means that no more can be caught. It means that if you have one in your possession, you can re-sell it but only within the country it resided as of June 2007. You cannot ship it beyond your country's borders. Also, you cannot sell it on ebay. In accordance with these laws, we cannot buy sawfish bills that are outside the U.S., nor can we sell them to a buyer outside U.S. borders. Do not even ask. We are happy to sell any available below to U.S. buyers. now an endangered species. These specimens come from collections long pre-dating the endangered status. Genuine saw fish bills from northern Australia, and from Bangaladesh. The largetooth sawfish is a heavily-bodied sawfish with a short but massive saw which is broad-based, strongly tapering and with 14 to 22 very large teeth on each side - the space between the last two saw-teeth on the sides are less than twice the space between the first two teeth. found in shallow tropical Indo-West Pacific oceans from East Africa to Papua New Guinea, north to the Philippines & Viet Nam, Bangladesh, coast of India, and south to Australia. Metal hanger hung through 2 drilled holes in back side. The sizes of these blades make a terrific wall display. More information below. Actual Fedex ground insured shipping to 48 states will apply, or Fedex express to Alaska & Hawaii. NO SHIPPING OUTSIDE THE U.S. for these items. #SAW-6-2. Sawfish bill shown front and back. It measures a full 31-1/4" long; 29 pairs of teeth average size 7/8"; bill is 4-1/2" across at the base, 3-1/4" across at the tip, 15/16" thick. Indelible ink on front says "Sawfish 12.5 feet" indicating the size of this fish. Bill is 34-1/4" long x 6-1/8" wide at base, 2-1/4" wide at tip, 1-3/8" thickest; 52 teeth (3 missing teeth); average size of teeth: 1-1/8"
Sawfishes belong to a group of fishes called elasmobranch that includes sharks, rays, and skates. All Elasmobranch species have a skeleton made of cartilage like sharks. Sawfishes are actually a type of ray. Sawfishes all fit into one family known as Pristidae, derived from a Greek term meaning "saw". Sawfishes possess the characteristic long, flattened, toothed saw, a flattened head and trunk, and a shark-like appearance and manner of swimming. Once lost, the teeth along the saw are not replaced. Sawfishes worldwide are poorly studied and no one knows for sure the number of living species, but there are an estimated four to seven species worldwide. The ranges of both species have been reported to include Florida, but only three specimens of the largetooth sawfish have ever been reported from Florida. 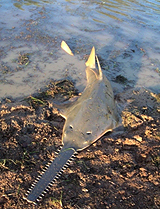 The typical range of the largetooth sawfish is further south and west of the state. The smalltooth sawfish is by far the most often reported species of sawfish on both coasts of Florida. Hundreds of specimens have been reported throughout Florida, today more in southwest FL. The　knifetooth sawfish　(Anoxypristis cuspidata), also known as the　pointed sawfish or narrow sawfish, is a species of sawfish in the family Pristidae, part of the Batoidea or extension on their snout. This is lined with sharp transverse teeth, arranged in a way that resembles the teeth of a saw. It is found in the shallow coastal waters and estuaries of the Indo-West Pacific, ranging from the Red Sea and the Persian Gulf to southern Japan, Papua New Guinea and northern Australia　Anoxypristis, but was previously included in the genus Pristis. Compared to that genus,　Anoxypristis　has a narrower rostral saw with numerous teeth on the distal part and no teeth on the basal quarter. This endangered species reaches a length of up to 15　feet long. Bill is 19-5/8" long x 1-1/2" wide base, 1-1/8" wide at tip; 1/2" thick; 37 teeth plus 1 partial tooth; average size of teeth: 5/8"
Bill is 20-3/4" long, x 1-1/2" wide base, 7/8" wide at tip; 1/2" thick, 39 teeth, average size of teeth: 7/8"
This is a fossil sawfish rostral tooth from the pristis species of sawfish. Similar to the modern day sawfish, this creature had a long, hard shovel-shaped snout lined on both sides with long, spine-like teeth (these are the spine-like teeth offered for sale here). Modern Sawfish are very lethargic animals, spending much of their day nestled in the muddy sea/river floor. At night, they scull slowly through the shallows, using their sensitive saw to find buried prey, which are then raked from the sediment to be consumed. It is useful to view the sawfishes' unique rostrum like a metal detector combined with a clam rake. If small fishes, like mullet, swim past a hungry sawfish, this great ray will launch from the bottom, slashing its toothy weapon rapidly side to side. Gouged by the snout's awl-shaped teeth, injured fishes tumble to the sea floor, now immobilized and easy to catch. The toothy rostrum is also a weapon of defense. When threatened, sawfishes will smack this jagged sword against attackers, whether they be sharks or fishermen. Generally, though, sawfishes are very gentle animals, preferring to lie quietly, undisturbed. Roughly 40 species of modern sawfishes are known; only a handful survive today.